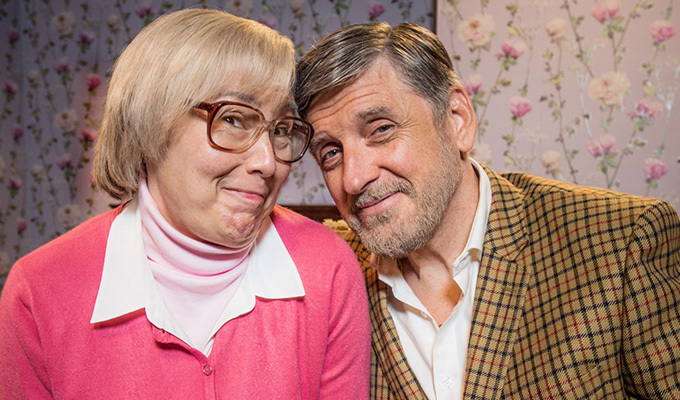 Craig Ferguson returns to British screens tonight after his long stint as a late-night host on American TV, appearing in the series finale of Still Game as a Stuntman call Callum Coburn. Here he speaks about his love of Ford Kiernan and Greg Hemphill’s show, how he found himself staining in a canal, and the prospects of him starring in a spin-off. How did your involvement in the show come about? Through being a fan really. I had been a fan of Ford and Greg from the days of Chewin' The Fat, which was a great show. I ran into them in Los Angeles of all places when they were out there writing this series and I said: ‘Well you could at least write a part for me!'. Greg said: 'Well actually, it turns out there is something we’re thinking about.’ So I said 'Well let me know’. I signed up before I even read it because I trust them and thought it would be fun. And I was right, it was. Can you tell us a little bit about your character, Callum? Callum is a man from Craiglang who left a long time ago to seek his fortune in America as a stuntman. He’s reached a point in his life where he’s returning home to check up on his old life. He wants to come back and reconnect with old friends - Isa [Jane McCarry] being one of them. Was it good fun to play a retired stuntman? I have to be honest with you I don’t do my own stunts! I barely do my own acting! It’s fun to watch other people dress up as you and do dangerous things but I leave stunts in the hands of the professional. It was such a strange experience because after the first hour I felt like I’d been doing it for years. First of all I knew a lot of the crew, people that I’d worked with in the BBC from ages ago, so it felt very comfortable. I haven’t loved doing a job as much in years. I thought Jane was fantastic. When I turned up on set and met this rather glamorous actress who wasn’t yet transformed into Isa it was amazing. What do you think is the secret of Still Game’s success? I think it’s because it’s honest and it’s funny. It has a lot of heart but it’s not sentimental. Scottish people in particular like that, they like heart but they don’t like sentiment. James Joyce said: 'Sentimentality is unearned emotion,' and he’s right. The emotion in Still Game is a real thing but it’s not clouded in sentimentality and I think that’s good. Any memorable moments from filming? I do remember being in the Forth and Clyde canal at one point and thinking: 'Ford and Greg had said to me ‘It’s easy! You just put some talcum powder in your hair and wear a cardigan and you’ll be fine'!' And there I was standing in the canal which is freezing all the time and I thought: 'Well this has got a wee bit out of hand!' But I loved it and it was so funny. How did it feel to turn into a pensioner? I was alarmed at how easy it seemed! They were like: 'There you are, we’ve combed your hair and here’s your tweed jacket…off you go!' I thought 'Really that’s it?’ It was interesting. The clothes are very comfortable I can see why people do it! Although Callum’s a little more dapper than the other Craiglangers but I still kind of liked it. He has a kind of Douglas Fairbanks jauntiness about him which I don’t really have in my own life. If you could be any other Still Game character who would you choose and why? I think it would choose to be Boabby. He controls the alcohol in Craiglang and I think that means he controls a lot of what is going on. He’s the gatekeeper to the pub and that’s a very powerful position to be in. And he has a fantastic mullet… it’s the greatest. Callum appears in the final episode of Still Game. Is there scope for him to return, and would you do it? Oh I would! That kind of decision belongs to others but I would do it in a heartbeat to work with these guys again. Comedy is in your genes, what other comedies do you enjoy? Everything. As far as British comedies go, recently I’ve been very into Matt Berry’s Toast Of London. I just love Matt, I think he’s a sensational performer and I love what he does. I also really like The Windsors with my old pal Harry Enfield. It’s scathing and I love that fact that they’re all clearly kissing their knighthoods goodbye at the same time making a great show. Was it nice to come back to Scotland to film again? Yeah it was. I’ve been over in America for 23 years now but I’ve actually been back in Scotland for a lot of that time too. What I stopped doing was I stopped working in Britain but I’ve continued to come back to my home in Ayrshire. I’m back here a lot. How have you found your time in the States? Well, after 23 years, it’s a mixed bag. Some of it’s great and some of it’s tough but it’s where my life is. I couldn’t sum it up easily for you, my kids are American, my wife’s American, my life to a large extent is American and certainly I pay my taxes in America so it is what it is. I’m very grateful to America for the opportunities it gave me. I’m grateful to have done well there and been given a lot of support there. It really changed my life going there, it’s lovely. I do a radio show and I’m doing a tour of America and Canada in the Autumn. I tend to do a stand0up tour, even just a little bit, every year. This is a bigger tour and I haven’t done one this size for a couple of years. Can we expect to see you back on UK TV again soon? It depends! I’ve said to Jane we should do a Still Game spin-off of Callum and Isa: The Golden Years. It would be like Frasier which was the spin-off of Cheers of course. There are people in charge of that kind of thing and it’s their ball and I don’t get to choose but can you imagine? I think it would be lovely and I certainly would think about that. The people that work on Still Game are just spectacular, they really are. And it’s not just good feeling about working with Scottish actors, they really are an exceptional bunch of people and I’d happily work with them again. • Still Game is on BBC One at 9.30pm tonight.